The 6.7-kilometer long procession, which reached the Minor Basilica of the Black Nazarene at around midnight, was flanked by dozens of volunteers and government agency workers intended to bring some order to the throng of devotes. Many tried their utmost to get near the 200-year-old statue in order to throw small towels to volunteers manning the carriage, believing that wiping parts of the cross and statue will miraculously transfer its supposed healing powers to them. But during the often hectic procession, one volunteer accompanying the statue died of a heart attack. 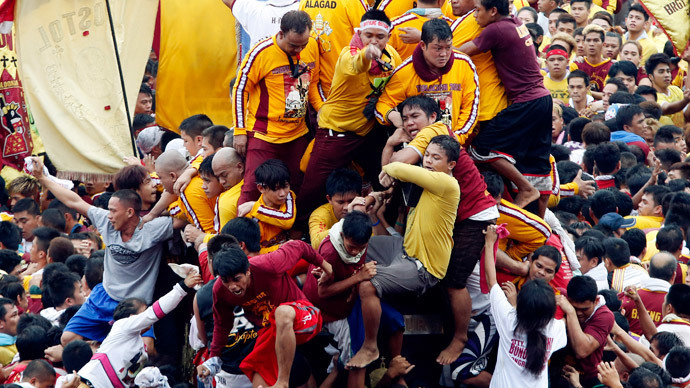 Another man’s body was found lifeless before dawn on Saturday as the throng of devotees surged towards the Minor Basilica of the Black Nazarene, colloquially known as Quiapo Church, AP reports. Nearly 1,000 others were treated for an array of injuries, including cuts, bruises, dizziness and hypertension, Gwen Pang, secretary general of the Philippine Red Cross, told the agency. The government viewed Friday’s procession as a potential precursor to a visit by Pope Francis to Manila next week, which could attract up to 6 million people. President Benigno Aquino III said 25,000 police and soldiers would be dispatched to keep order, in contrast with the 5,000 police officers 1,000 military personnel who were deployed to secure Friday’s event. "But with 25,000 against 6 million, the government cannot do it alone," Aquino told reporters on Friday. "So we want to repeat this message: with cooperation from the church and various groups and the private sector, we will be able to achieve our goal of a peaceful and meaningful visit by the pope." The papal visit is slated for January 15-19.